In the 1880s, Manuel and Anna María Martín, founders of Martineztown in 1850, broke with the Catholic Church. Second Presbyterian Church was established in 1889 at the confluence of the efforts of the Martin family, James Menaul, and First Presbyterian Church, and the arrival of Epifano Arreola, a man incarcerated in Mexico City who converted to Protestantism and moved to Albuquerque, New Mexico. Thus the church's establishment was the result of the community's desire for a church, and not the decision of a Mission Board on the East Coast. Today, the richness of Second Presbyterian Church is reflected in many ways. The congregation is housed in a state and national historical landmark. The worship services are planned around the liturgical year, and the sermons are based on the lectionary. The liturgy is in both English and Spanish, and hymns are sung in both English and Spanish using the Presbyterian Hymnal and El Himnario. 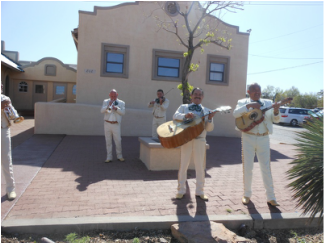 The congregation is truly NEW MEXICAN, seen in its predominantly Hispanic ties and roots, as well as its openness to all ethnic groups (including Anglos, African Americans, Native Americans, and Filipinos, etc.). In the past year, a bilingual model of worship has developed. All bulletin liturgy is printed in both Spanish and English, and "side-by-side" Spanish-English Bibles are available so that readings may be followed in your language of preference. A new sound system includes hearing amplification devices available for those with auditory difficulties. The building is wheel chair accessible. In the the almost 30 years he served at Second Presbyterian Church, Rev. José Candelaria helped grow the membership to over 300 members, started the Martineztown Community Center (MHNS), held a Spanish only service, conducted prayer services on Wednesday nights, and transported people to the church and home again. Jose Ines Candelaria was born in in Rosa New Mexico in 1894. At the age of 12 years, Jose Ines Candelaria was orphaned with the death of his father. His family was taken in by his uncle Agustiniano Candelaria whose son was an enthusiastic student at Menaul School. His enthusiasm ignited Jose's curiosity and coupled with a promise he made to his dying father to continue his education, Jose attended Menaul School. While a student at Menaul he joined the Spanish Church in the Barrio of Los Martinez and accepted Jesus Christ as his Lord and Savior. Jose was a hard worker! By 1914 Jose was a Lay Preacher at several Mission Stations close to Albuquerque. In addition, he spent his summers working on farms, building roads in the White Mountains of Arizona, and working in an automobile factory. In 1917 he was drafted to serve in the Army during World War I. He served overseas in France and trained recruits. When he was discharged he enrolled in the University of New Mexico, and worked at Menaul school as a Spanish teacher. During this time, Jose met and married his wife Adela Chavez. He then attended college in Dubuque Iowa and graduated with several seminary credits, but before he could finish his seminary work he was called by the Board of Missions to help with a young church in San Pablo, Colorado. While in Colorado, he was called to take charge of the Spanish Sunday School and Medical Clinic in Denver, Colorado. Jose finished his seminary work in Iliff School of Theology. In addition to his work in Denver, he organized a Sunday School in Brighton, Colorado. He developed this school into a church and also organized a Community Center. In addition he also assisted struggling Spanish churches in Greeley and Fort Collins, Colorado. In 1935, after 12 years in Colorado, he was given a call by the Spanish Church in Los Martinez to serve. He was coming home! In the the almost 30 years he served at Second Presbyterian Church, he help grow the membership to over 300 members, started the Martineztown Community Center (MHNS), held a Spanish only service, conducted prayer services on Wednesday nights, and transported people to the church and home again. Under his service and leadership our congregation was the largest Spanish Presbyterian Congregation in the nation at the time! 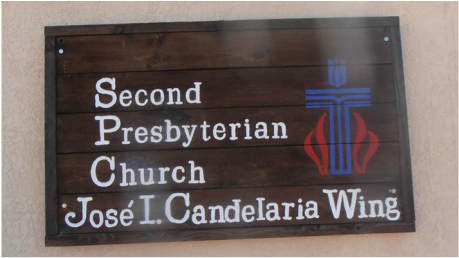 In addition to the work Reverend Candelaria did at Second Presbyterian Church he also conducted Spanish services in Santa Fe and Placitas, organized a Church School in Pajarito, started a church in Bernalillo and Alameda, held a one hour service on KOB Radio once a week as part of the Hispanic Ministerial Alliance, and was President of the Council of Spanish American Work. 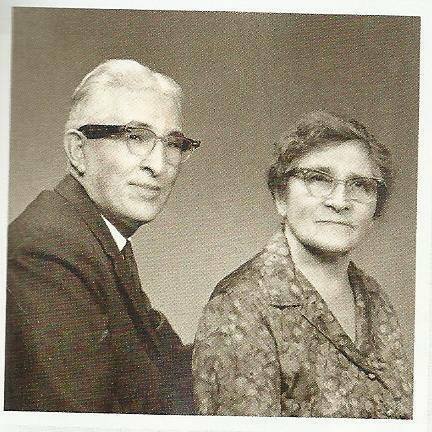 On Easter Sunday 1962 Reverend Candelaria retired, but then served for a brief period as the "closing pastor" of the North Minister Presbyterian Church in Albuquerque. When he officially retired he lived in Albuquerque with his wife and family until his passing on June 10, 1977. 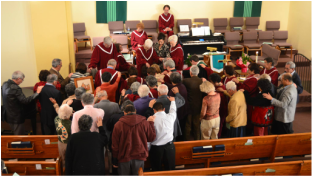 To this day Reverend Candelaria's influence and presence can be felt at Second Presbyterian Church, and many of his descendants serve as leaders in our church. We are grateful that you can visit the Candelaria Wing and, we hope you can join as we enter a new phase in the life of our church while celebrating a man who helped breathe life not only into our church, but in various churches and organizations in New Mexico and in Colorado! Below are photos of the historical photos that are displayed on the South wall of Fellowship Hall. Since they are photos of photos, it was practically impossible to avoid glare when taking the photos. Perhaps someday we will disassemble the frames and scan in the photos.